We no longer sell Service Dog Tags for any animals except Dogs. - Shipping rates to Canada are $25.95 for International Priority Mail. Due to the poor deliverability and tracking of first class mail to Canada we will only ship by International Priority Mail. - International Priority Mail to Canada can still take well over a week to clear customs and be delivered once we ship it. If you need this item in less than two weeks do not order. You get four Canadian Service Dog ID cards with your order, three for your dog and one for you to carry in your wallet. Your Canada Service Dog ID Tags clearly identify your companion as a Service Dog with his or her picture on the tag. 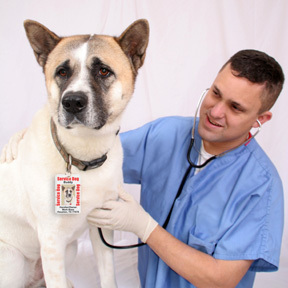 Our Canada Service Dog ID Tags clearly identify your animal as a Service Dog with his or her picture on the tag. We provide two cards with each order, one for your dog and one for you to carry in your wallet. I recently ordered my Canadian service dog tags. They arrived within a few days, A lot faster than expected. The quality of the product was exceptional. I just put an order in for the service dog vest as I did forget to add it to my original order and am looking forward to receiving it. I definitely will be a return customer. I like the service dog tags, they have bright colors, the photo was inserted very clear and nice, the material was good for the large tag. The three smaller ones though seem a little frail, considering they will be hanging from the dog's collar and they may easily get ripped off. Delivery was pretty fast with no problems. Very professional company. Item rec'd 3 days after purchase. Item is authentic looking and website easy to manuever through. I am impressed that they offered dog tag for the Canadian buyer as well! Disabilities have no boarders and now I can have my helper with me! Many thanks for your services I will be back in the future!!! Click the button below to add the Canadian Service Dog Tag Set for Small Dogs (1 Lrg, 3 Sm) to your wish list.